The bee-eaters are a group of land birds in the family Meropidae. They live in the Old World and Australasia: Africa, Asia, Europe, Australia, and New Guinea. They have richly coloured plumage and slender bodies. They have long downturned bills and pointed wings, which give them a swallow-like appearance. There are 26 different species of bee-eaters. 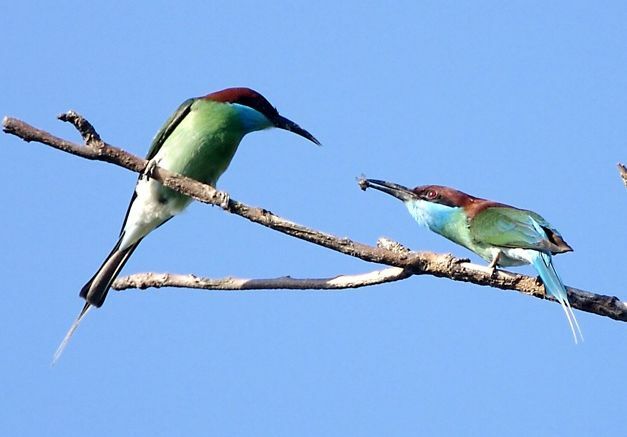 As the name suggests, bee-eaters eat flying insects, especially bees and wasps. They catch them in the air by darting from a perch. The birds only catch prey which is flying: they ignore flying insects once they land. Mostly, they eat honeybees. Hymenoptera (ants, bees and wasps) make up from 20% to 96% of all insects eaten. Before eating its meal, a bee-eater removes the sting by repeatedly hitting and rubbing the insect on a hard surface. The bird squeezes out most of the venom. Bee-eaters live together. They form colonies by nesting in burrows tunnelled into the side of sandy banks, such as those that have collapsed on the edges of rivers. Many of these holes occur together. Most of the species in the family are monogamous, and both parents care for the young, sometimes with the assistance of other birds in the colony, a behaviour rather unusual for birds. Merops species such as the white-fronted bee-eater usually have a black bar through the eye. The southern carmine bee-eater is adversely affected by persecution and habitat loss. Bee-eater Facts for Kids. Kiddle Encyclopedia.